Heavy rain didn’t dampen the excitement at the Dorothy Chandler Pavilion on the evening of March 10; Orpheus and Eurydice, the highly anticipated collaboration between the L.A. Opera and the acclaimed ballet company Joffrey Ballet, was set to debut that night. Christoph Willibald Gluck’s 1762 opera Orfeo ed Euridice has been remastered by Hamburg Ballet’s artistic director John Neumeier, who accorded it a contemporary context. The characters Orpheus and Eurydice have been plucked from the ancient Greek myth and plunked down in the modern era, even though, incongruously, they retain their archaic monikers. Act I begins with Orpheus (Maxim Mironov), an exacting choreographer, running through rehearsals for his brainchild The Isle of the Dead. His impetuous wife Eurydice (Lisette Oropesa), the company’s prima in more ways than one, arrives late, and they quarrel. She slaps him, leaves in a huff, then promptly gets into a car accident and is killed. Orpheus enters a delirium of grief, but his assistant Amour (Liv Redpath), dressed down in jeans and sensible shoes, delivers a sliver of hope, informing him that the gods, moved by his tears, have granted him a second chance. Here, the storyline enters familiar territory for those acquainted with the myth; Orpheus can resurrect Eurydice if he leads her out of the Underworld without even a fleeting glance. Orpheus enters the Underworld without batting an eye at the Furies, who initially live up to their name but are eventually placated by Orpheus’ calm conviction and saintly suffering. They grant him entrance to Elysium, an afterlife utopia of beauty and serenity. The doomed lovers are reunited, but Eurydice, resentful of his cold shoulder, waxes melodramatic over his perceived indifference. Finally, Orpheus can no longer hold back and rushes to her, only for her to perish once more. Her second death is hardly a spoiler, of course, but witnessing Orpheus’ steadfast lack of communication and Eurydice’s emotional manipulation heighten until they collide and culminate in tragedy — one can’t help but wish the two had attended a few couples’ counseling sessions. While Orpheus and Eurydice may be the leads, the Joffrey corps de ballet often inadvertently steals the show. The dancers appear in a variety of contexts: as regular dancers, clad in legwarmers while stretching their feet and marking steps, a charmingly meta reproduction of an actual rehearsal; as the Furies, sporting thorny headpieces, blackened eyes and stony expressions, their movements, lunging and desperate; as the heavenly, ethereal beings that glide tranquilly through Elysium in gauzy white tunics; and back to themselves, attired in verdant performance ensembles as Orpheus’ vision of The Isle of the Dead finally comes to fruition. Inspired by Arnold Bocklin’s painting of the same name, the set design is also a work of art. One of the most striking moments of the show is when the Furies introduce themselves by thrusting their arms and hands through the canvas backdrop — classic horror movie imagery. The rented set remains for the duration of the act, spurring uncertainty as to whether the gashes are legitimate or just thoughtfully positioned Velcro. Other sets, such as the ones located in Elysium, are minimal, geometric and mobile, evoking the fluid and ephemeral nature of the afterlife. Walls of translucent glass and shiny reflective surfaces allow dancers to consort with their doppelgangers and blur the boundaries between artifice and reality. Ballet and opera are, perhaps unfairly, considered the two classical theatre experiences that are the most likely to put the audience to sleep. They are also, entirely fairly, regarded as appealing to a very specific demographic. When the L.A. Opera unveiled Orpheus and Eurydice, it’s easy to dismiss the whole exhibition as another exercise for the elite. Regardless, the production is an undeniable tour de force, the two art forms serving to enhance rather than undermine the other, a testament to the power of interdisciplinary artistic collaboration. 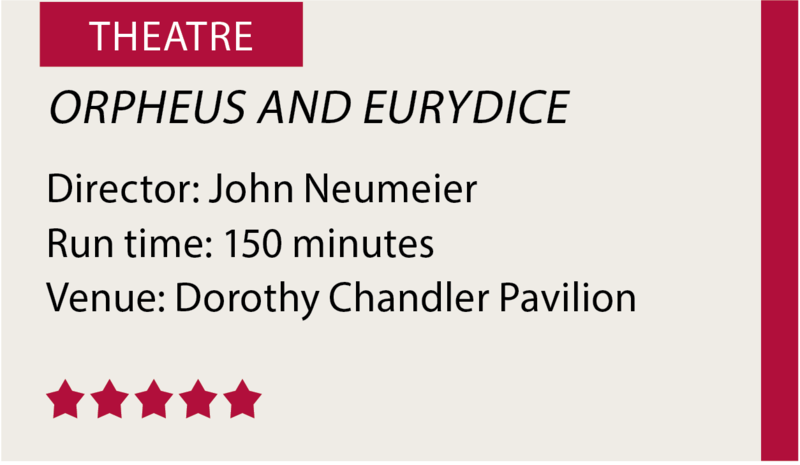 Orpheus and Eurydice will conclude its run at the Dorothy Chandler Pavilion on March 25.